Drive footfalls to your business just by tapping at the storefront, sale signs or digital signage - deliver offers, listings or contact information. Proactively engage with consumers and broadcast relevant deals and product information that help them make smarter decisions. Send beacon notifications straight to customers’ smartphone and lock screen, to issue stamps and rewards for the next visit. Reduce the waiting time, engage with them and streamline your queue management with smart proximity solutions. Reduce the friction in app download. Enable them to use smartphones to tap or scan QR codes and NFC tags on posters and stickers around. Help customers re-order their favourite product from anywhere! Direct them to your online store when they scan the product in hand. Re-connect with your loyal customers on Facebook and Google to drive them back into your store. Reach out for feedback when it matters the most. Get customers to scan or tap the product, and leave feedback when they use the product. With Beaconstac’s powerful analytics engine, get instant access to all the campaign analytics and measure the efficacy of offline marketing channels. Beacons are small battery-powered Bluetooth devices that broadcast location-triggered rich notifications to smartphones nearby. Most businesses use beacons to boost engagement inside the business premises. NFC tags are built with the power of simplicity. It allows businesses to deliver information in a single tap. It doesn’t require any pairing or pre-configuration. Most iPhone devices and all Android devices have in-built NFC capabilities. QR codes are used by marketers and small business owners to build awareness and engage customers. These 2-D barcodes can be scanned by smartphones to transfer information. iPhone cameras have in-built QR code scanning capabilities. Just stick Bluetooth beacons, NFC tags, QR codes or a combination of the three on your business premises. With our dashboard, create quick landing pages, forms and compelling notifications. No coding required. Personalize the experience with contextually relevant messaging - push as an app notification or enable tap to learn. Are you a small business solution provider? What is proximity marketing? Which technologies make it happen? Proximity is about reaching out to customers based on their closeness to physical objects, such as retail store entrances, a house on sale (real estate) or a newly launched car in a dealership. Proximity marketing involves communicating with customers at the right time, the right place and with the right message, making marketing campaigns highly relevant, personalized and contextual. This channel of marketing includes beacon-based proximity marketing, NFC-based proximity marketing and QR code-based proximity marketing. With Beaconstac, you can build proximity marketing solutions without a developer. Speed up the campaign creation further by choosing from a host of markdown card templates which are proven to convert. What are some Bluetooth marketing use-cases and examples? Bluetooth marketing solutions are being employed in diverse array of industries, ranging from retail to real estate to museums. The use-cases within each of these industries are numerous. Proximity marketing devices, such as beacons are being used to drive targeted promotions, loyalty programs, exhibit information, push phone numbers wayfinding, broadcast deals and request feedback. 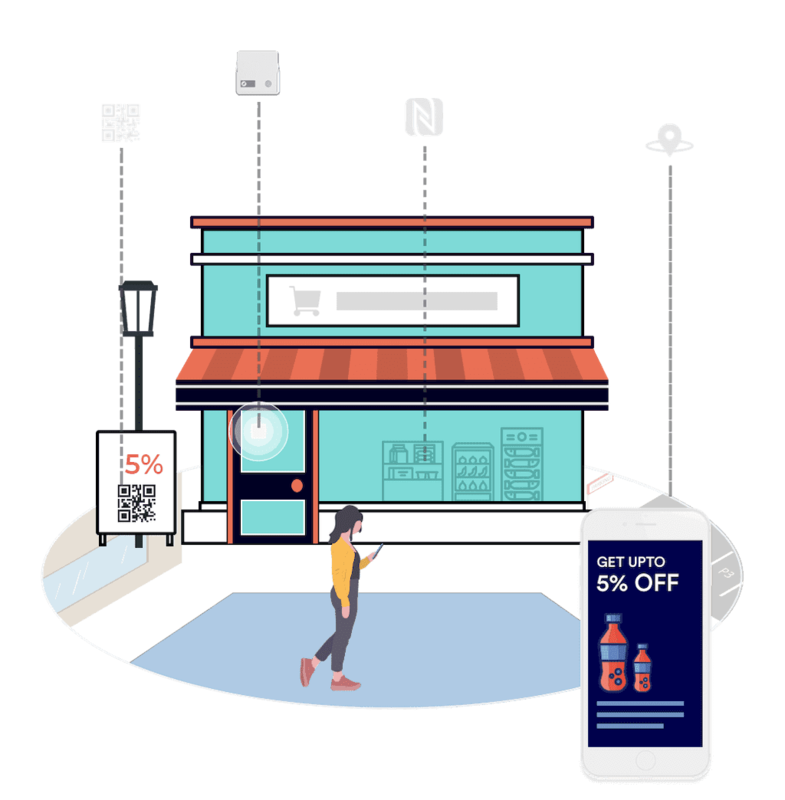 Bluetooth marketing (beacons) is used in retail to attract more visitors to the store, engage with them in-store, up-sell products, improve customer engagement and boost sales. Bluetooth beacons are leveraged in real estate to capture more leads, delight them in-property and close more deals. What are beacons? How does beacon technology work? Beacons are small Bluetooth transmitters that deliver location-based contextually relevant messages. Beacons work like lighthouses - instead of transmitting light, they transmit short-range signals which could be a combination of characters and numbers. Beacon technology works on Bluetooth Low Energy (BLE). The functionality is simple - Beacons transmit BLE signals through one of the beacon protocols - Eddystone or iBeacon. Bluetooth enabled devices, like smartphones scan for these signals. In-built services, like Google Nearby & Closeby, scan Eddystone signals on Android phones. iOS phones need apps, like Nearbee to do the same. Once the signal is detected, it is redirected to the associated marketing campaign. What is Bluetooth Smart or Bluetooth Low Energy (BLE)? Bluetooth has evolved over the years to communicate with users in a more natural and seamless manner. Bluetooth Low Energy (BLE) technology transmits signals at regular intervals and thus consumes less power. As a virtue of this evolvement, BLE technology has fueled a host of technological applications. BLE technology has easily replaced the legacy technologies in multiple use-cases and industry verticals. This is because it is extremely versatile in application and significantly reduces the cost involved in infrastructure and initial setup. Bluetooth beacons are the major disruptor in the iOT space. They are being used by companies to solve existing business challenges and get more business. Why is beacon marketing effective? How is it appealing to marketers? Proximity marketing beacons are vastly superior to legacy advertisement channels and competitor technologies. Companies are turning away from traditional forms of advertisement and are looking more favourably towards proximity marketing solutions, as a means of sending more relevant and contextual messages to a targeted audience. Beacon marketing campaigns see high click-through rates, do not need apps to transmit notifications and have excellent ROI. With proximity beacons, marketers can also measure offline analytics. Bluetooth beacon marketing also allows marketers to establish a deeper connection with customers by retargeting them on Facebook and Google. named Beaconstac a favourite among small business owners.